All the candidates out there aspiring for the central government jobs kindly pay attention to this important announcement. 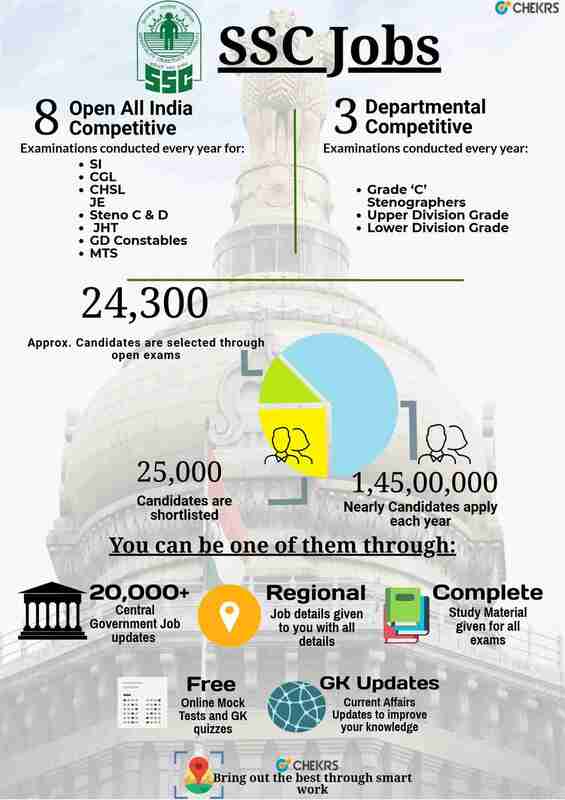 Here at Chekrs we give you the details of the SSC Recruitment 2019. The Staff Selection Commission is among the well paid jobs which provide job security and promotion as well. The SSC selected most eligible candidates through rigorous SSC Jobs Notification 2019. Through Chekrs you can get delivered all the SSC Exam Schedule notifications that match best as per your educational level. We deliver you complete details of the SSC Jobs detailing its profile, vacant positions, eligibility, selection process and how you can apply for them. You can even get all the SSC Latest Recruitment 2018 at its latest through subscription of Chekrs. The SSC Vacancies are released across the year at different intervals. All of these SSC Vacancy Notification call candidates from different education background. You can know which best exam you should appear for through the SSC Jobs for 10th pass, Graduates, MBA, Engineers, etc and many more filters provides by us. You can even locate the right job through SSC Jobs in AP, Assam, Haryana, UP and other states as per your residence. Why Chekrs for SSC New Vacancy? The selection in the SSC Bharti is not easy. All those who apply need to keep it in the mind that they will have to pass the exam beating the tough competition. Being the Chekrs reader you are privileged to access the free study material that can help you achieve better score. We provide you the previous papers, model papers and online mock tests. Also you can improve and test your GK with the daily current affairs and its GK quiz.